OrthAlign, Inc., a privately held medical device company announced the much-anticipated U.S. commercial launch of its ORTHALIGN PLUS® system, a palm-sized, single-use navigation device for Total Hip Arthroplasty (cup placement, leg length, and joint offset) surgeries. “OrthAlign has done it yet again. A simple and easy to use navigation system for hip replacement that provides the surgeon real quantitative feedback without the cumbersome hassle of expensive big box navigation devices," said William Bugbee, MD. OrthAlign Plus provides measurement accuracy of ±3°, with at least 95% confidence when measuring the angle of the shell impactor, relative to the frame of reference defined by the registered landmarks. The device has been tested and validated to achieve 1) acetabular shell navigation accuracy for both inclination and anteversion, 2) measurement accuracy for changes in the femoral position in the superior-inferior direction, and 3) measurement accuracy for changes in the femoral position in the medial-lateral direction. “OrthAlign has done it yet again. A simple and easy to use navigation system for hip replacement that provides the surgeon real quantitative feedback without the cumbersome hassle of expensive big box navigation devices. It’s all right there in the palm of my hand,” said William Bugbee, MD (Scripps Clinic, La Jolla, CA). 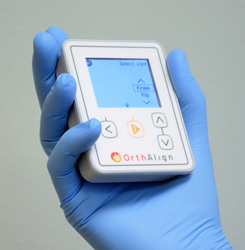 “Surgeon training will be a vital component of the OrthAlign Plus launch. This technology will allow surgeons to approach Total Hip Arthroplasty surgeries in a new and different way. We will emphasize extensive training through every step of the surgery to drive surgeon success and promote better patient outcomes using OrthAlign’s precision technology,” said James Young Kim, OrthAlign’s Vice President of Marketing. Additionally, OrthAlign’s award-winning KNEEALIGN® technology will be fully integrated into the OrthAlign Plus system, continuing to provide a reliable and efficient alternative to expensive Computer Assisted Surgery (CAS) systems, logistically arduous patient-specific cutting blocks, and invasive conventional methods used with an intramedullary rod, for Total Knee Arthroplasty surgeries. To date, KneeAlign has successfully been used in over 30,000 Total Knee Arthroplasty cases, throughout the world. In a recent study (conducted as a randomized control trial, consisting of five different surgeons) by Denis Nam, MD (Washington University, St. Louis, MO), it was found that KneeAlign decreases the incidence of outliers for tibial component alignment in both the coronal and sagittal planes, and improves the surgeon’s ability to achieve a specific, intraoperative goal, compared to conventional, tibial extramedullary (EM) alignment guides in TKA. In the KneeAlign cohort, 95.7% of tibial components were within 2° of perpendicular to the tibial mechanical axis and 95% of tibial components were within 2° of a 3° posterior slope (compared to 68.1% and 72.1% in the EM cohort, respectively). Dr. Nam also found significant differences favoring the use of KneeAlign vs. CAS with regard to the accuracy of femoral component alignment, with 94.9% of patients in the KneeAlign cohort having an alignment within 2° of neutral vs. 92.5% in the CAS cohort. There was a significant difference in overall mechanical alignment of the limb, with 92.5% of patients within 3° of a neutral mechanical axis in the KneeAlign cohort vs. 86.3% in the CAS cohort.